Lake Inle wasn’t part of my initial itinerary; I assumed it to be an overrated tourist trap and gave it a miss. I ultimately added it to the itinerary as the most travel person I know (he has been to over 100 countries!) insisted that I visit this locale… and I am glad that I did! 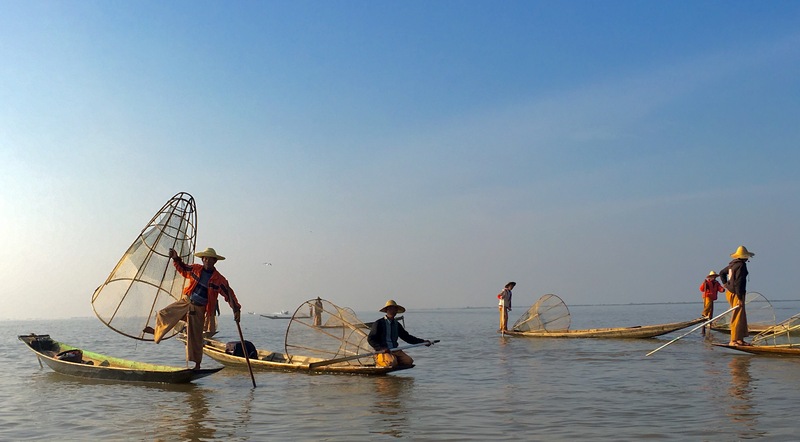 In turn, I insist that you add Lake Inle to you Myanmar itinerary… blue skies, floating villages, fishermen and smiling locals await you! I took a bus from Bagan to Nyuang Shwe, which is the town closest to Lake Inle. I boarded the bus at about 8:30 pm and reach Nyuang Shwe at about 4 am…and was glad that I had booked my hotel in advance. 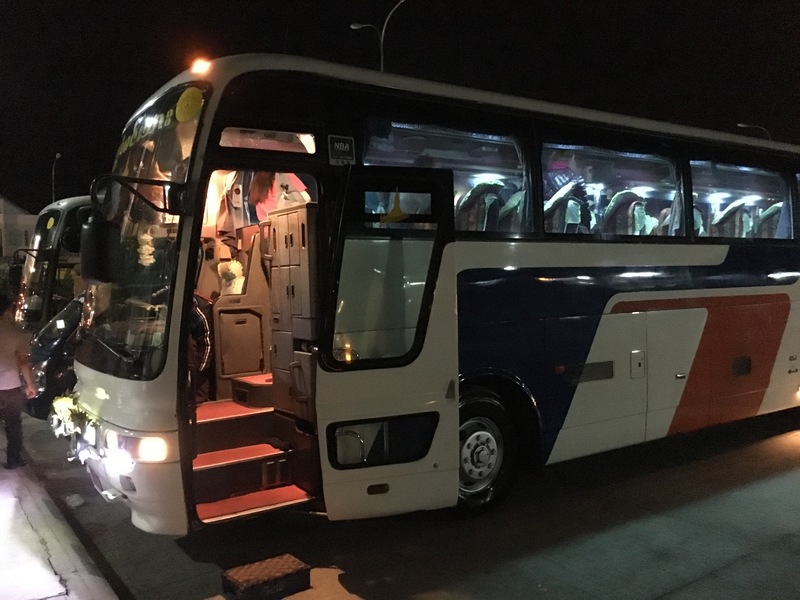 There are overnight buses from Yangon and Mandalay as well run by JJ Express/Elite Express that cost ~USD 20 and take about 8 – 10 hours. You can connect with them on FaceBook and book your tickets. Payment needs to be made prior to boarding the bus. Nyuang Shwe is at an altitude of 880 meters and the bus goes through twists and turns. At one point in time, in the middle of the night, I started wondering whether a drive full of so many twists and turns is safe enough at night. I got so paranoid after that I just could not sleep! If you think such a thought would bother you as well, take a flight. Alternately, take a bus during the day and enjoy the scenery around you. Lastly, if curvy roads around hills make your stomach rumble, pop a pill for motion sickness half an hour before ride. The closest airport to get to Lake Inle is Heho. This is a domestic airport and is connected to the major international entry points i.e Yangon and Mandalay by local airlines like Air KBZ, Air Wings Asia and Air Bagan. Book in advance to get yourself a seat at a low price. A one way ticket to Heho from Mandalay costs ~ USD 70 and from Yangon costs about ~USD 110 if it is booked a couple of weeks in advance. Heho is also connected to other domestic cities including Nyaung-U (Bagan) and Nya Pi Taw by air. 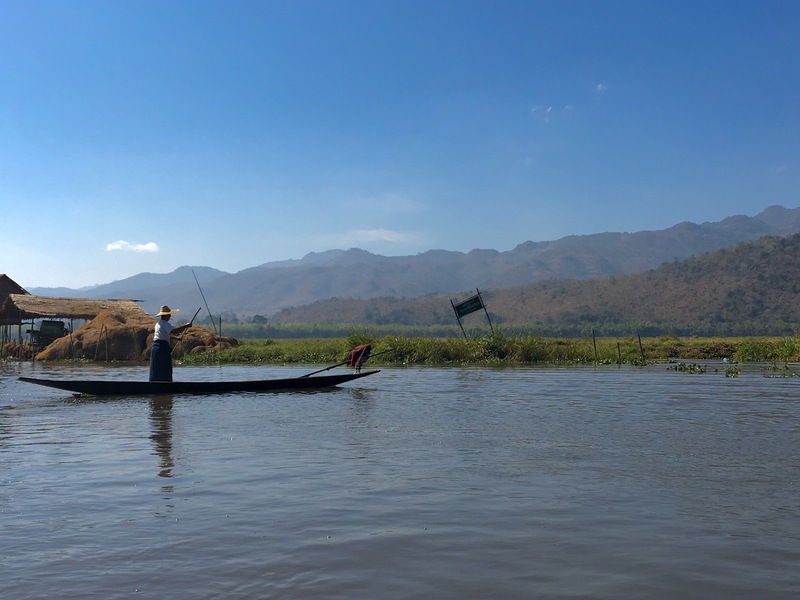 It takes one hour to get to Lake Inle from Heho, so plan accordingly. There is an entry fee of USD 10 charged as a ‘Fee for entering the Lake Inle zone’. The fee is charged while entering the Nyuang Shwe town, regardless of the time. I entered Nyuang Shwe at 4 AM by the overnight bus, and even at that hour the bus was stopped to collect the fee. There is a small ‘ticket’ issued on receipt of the fee, which is valid for one week. That’s another issue that the ticket wasn’t checked at any location during my two day stay. May to September is the wet season in the region. All other months are good to visit Lake Inle. Being at the foothills of the Shan mountains, the area is slightly cooler than Bagan and the surrounding plains. January and December are colder months, with mornings and evenings being chilly… more so on the lake. I was here in January and found the nights fairly cold, especially on the tuk-tuk rides. Do carry a jacket and scarf to keep yourself warm if you are visiting in these two months. Most hotels do not have central heating and I was happy to wear my woollen socks to bed. 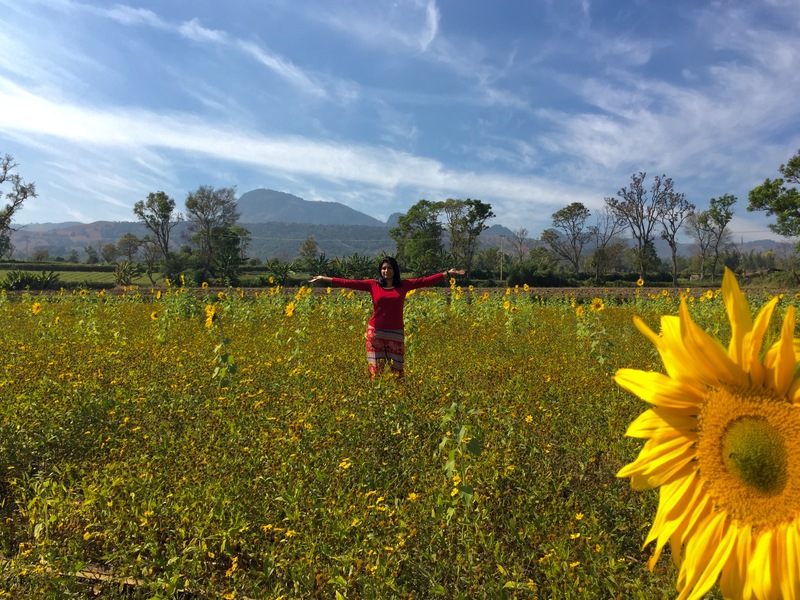 Perfect weather…with the sunflowers smiling! You can stay in a high end hotel built on stilts by the lakeside… or even on the water. These hotels offer great views and provide the special feeling of staying at the lake. However, they restrict your movement to shops and restaurants. The other option is to stay in the nearest land based town Nyaung Shwe. 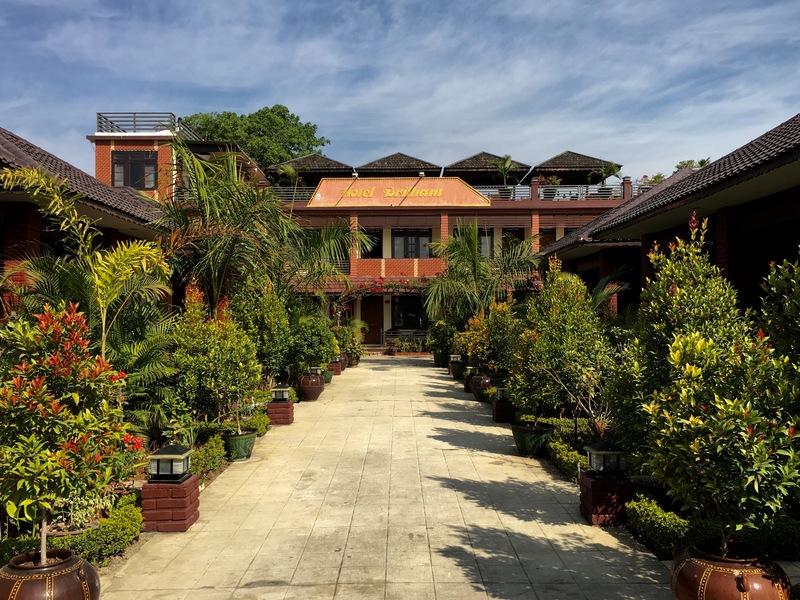 I stayed at Hotel Brilliant in Nyaung Shwe, which was truly brilliant! I spent ~USD 120 for two nights for a double room, including breakfast. The room was large, with interiors made of Burmese teak… and so was the bathroom. The staff helped me plan my day and arranged day trips for me. I was allowed to check in 4 am at no extra cost. Thumbs up for the property! The hotel is a couple of kilometers away from the main market/restaurant area. It cost me about Kyat 3,000 (USD 2.5) to get to the market by tuk tuk. Alternately, if you are fine using your muscles, there are bicycles available at the hotel which can be used to go to the market. Hotel Brilliant… It truly was brilliant! 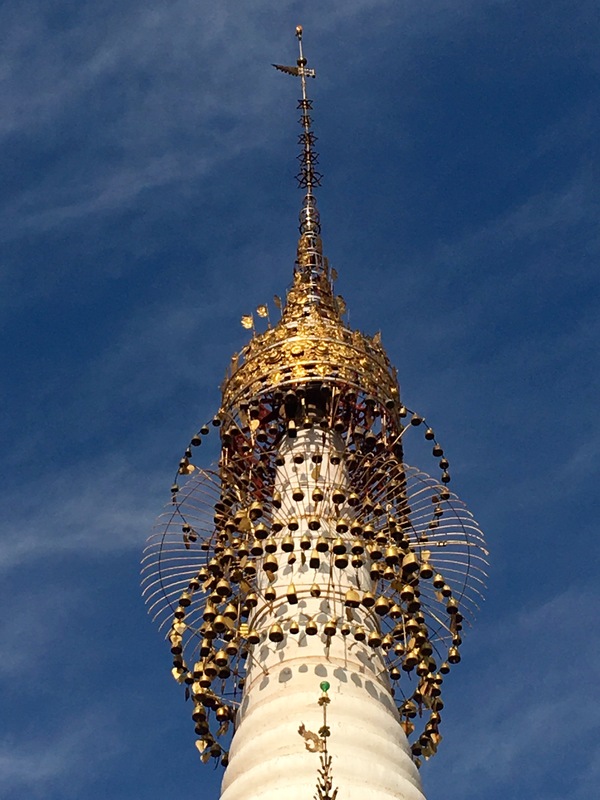 Over 2000 little pagodas huddle together at the Kekku pagoda complex… the oldest one being about 1000 years old and the youngest one being about 100 years old. This site was one of the highlights of my trip. The site is situated near Taungyii at a distance of about 250 km (from Nyaung Shwe), which takes ~2.5 hours by car. The site is not too popular and has been spared by tourist buses… at least till Jan 2016. You can spend a couple of hours here listening to the tinkling of tiny bells at the hti of the pagodas. The day tour cots ~ Kyat 55,000 or USD 45 (private taxi) plus the entrance fee (USD 3 per person) and guide fee (USD 5) and can be arranged by your hotel. I would highly recommend having lunch at the restaurant near the Kekku pagoda complex. It was one the tastiest meals that I had in Myanmar! 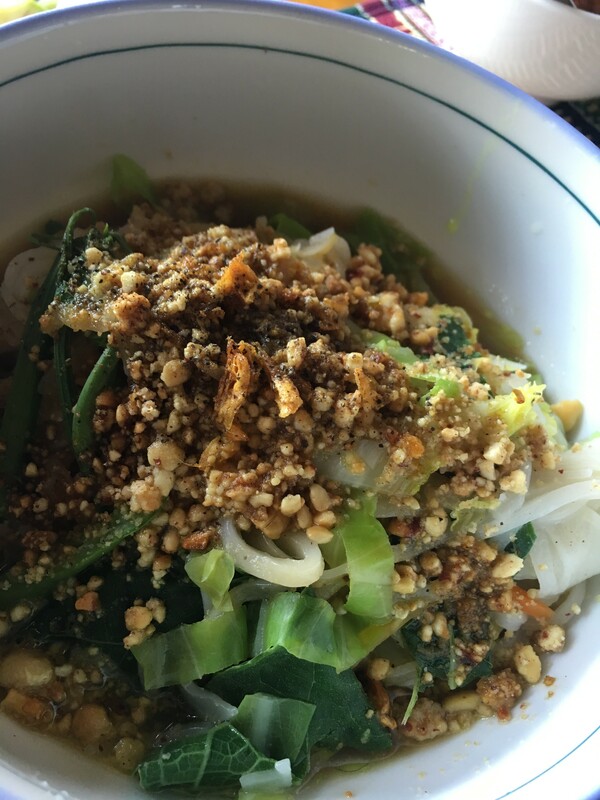 Yummy Shan noodles…in the Shan state! Until I reached Nyuang Shwe, I had no clue that Myanmar has a local vinery! 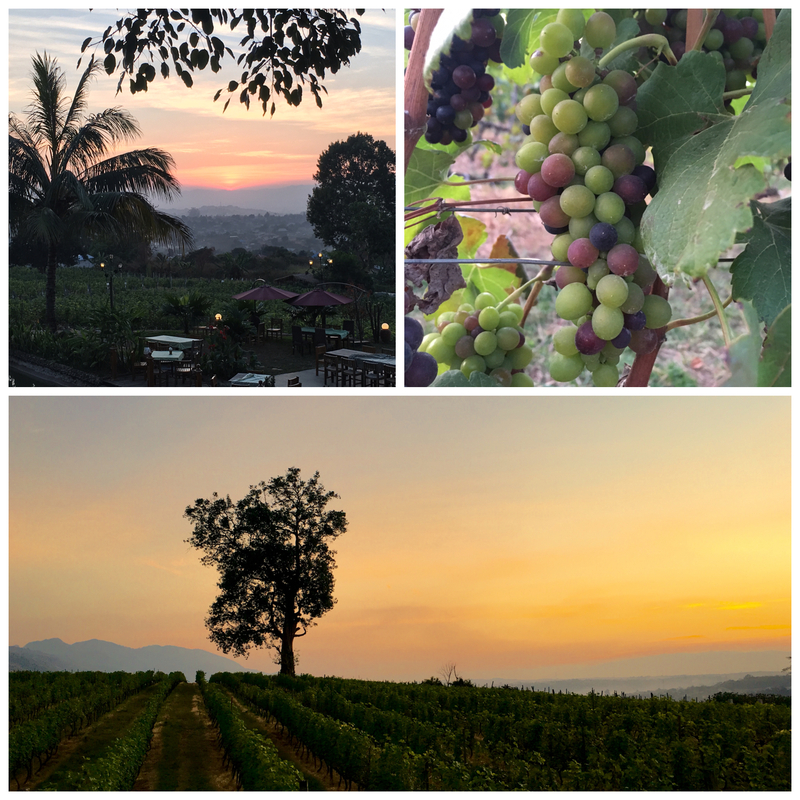 My hotel suggested that the Aythaya Vineyard Estate is one of the best places to watch the sunset, along with some bubbly. The vineyard is located about 45 minutes from Nyuang Shwe, uphill and you need a car to get here. Alternately, you can stop here on your way back from the Kekku Pagoda complex (its en route). I opted for the wine tasting (open till 6 pm only) which was really cheap… ~USD 2 only to sample four wines and had a pizza along with that. I would recommend going here for dinner if you want to enjoy and easy evening with a relaxing atmosphere. A day trip over Lake Inle was number one on my list of things to do. I wanted to avoid the ‘touristy’ villages and hence, decided to visit South Inle… an area that isn’t frequented by tourists much. The journey to Sankar village was worth every minute spent on the boat. 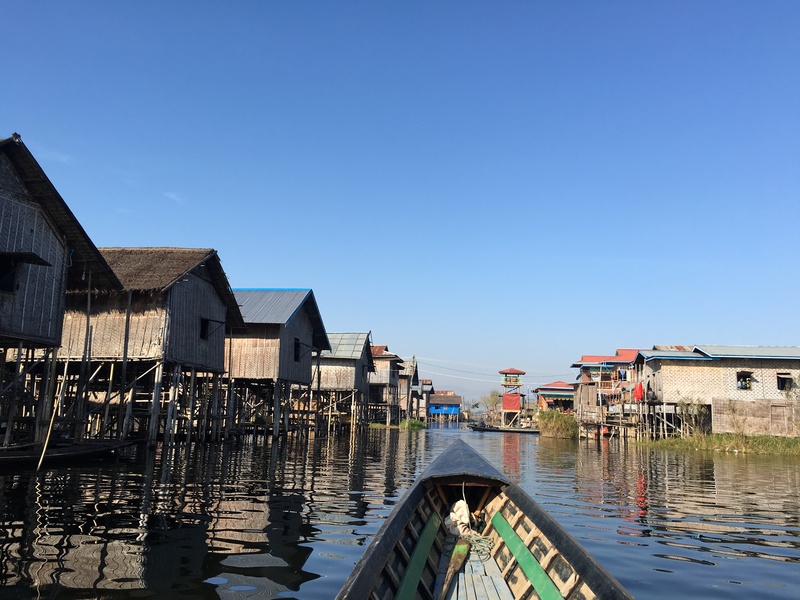 I saw floating villages with locals carry out their usual tasks, floating gardens with tomatoes and silk weaving workshops. The waters of the lake reflected the colours of the sky and I wanted to reach out to the fluffy little clouds that I could see in the water. Blue skies and perfect reflections…. The trip to Sankar village takes the entire day. I left my hotel at 8 am and was back after sunset. This is the most expensive of all the trips on the lake and costs ~ Kyat 65,000 (USD 50) per boat, which can seat five people. In case you have budget constrains, find someone to join you on the boat or opt for a shorter tour to Indein village and floating markets. Rent a cycle and explore the local setting, ride through dirt paths, grab a bite at local eateries and breathe easy under the shade of a pagoda. Start by heading to Khaung Daing Hot Springs, which can be a a good place to relax for a couple of hour… more of a spa like experience (~USD 10). Hop on a boat and cross the lake to visit the Forest Monastery and the Maing Thauk village. Half the village is set on dry land, while the other half sits on stilts over the water. On the way back, stop at the Red Mountian Vineyard for a drink and to watch the sun go down. Nyuang Shwe is a popular tourist town and there are plenty of restaurants that offer a variety of cuisines. The local cuisine is very much an option. However, if you are craving some beer and pizza, there are good options available in town. 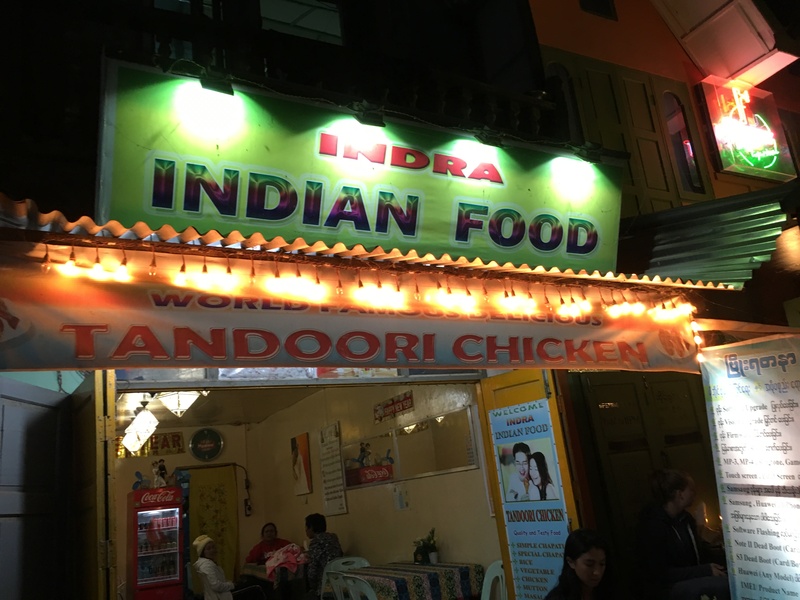 I also saw a couple of Indian restaurants. All the restaurants had vegetarian options and I never had any issues. Fancy some Indian food in Myanmar? I had my meal at the Golden Kite restaurant… salad, pizza, pancakes and hot chocolate and would recommend the place for the taste, service and free WiFi! Suggest carrying a jacket and a scarf for the mornings and the evenings over the lake, regardless of the season. Be respectful to the local customs and keep your shoulders and knees covered while visiting the temples and pagodas. The local market in Nyuang Shwe is great to buy traditional looking bags, woollens and other supplies that you may need. Pack a torch or a small headlight. It comes in handy while returning (walking or cycling) after sunset. Carry your swim wear if you wish to use the hot water springs. Nyuang Shwe is colder than Bagan during winters. Most hotels do not have heaters. Pack well! Happy to help you plan your trip to Lake Inle! Beautiful write up Sonia and useful tips. Inle lake has been a photographers delight. Totally! The reflections give picture a soul! I have been wanting to go to Myanmar for some time now. It looks like such an amazing country with lots of things to do and see. 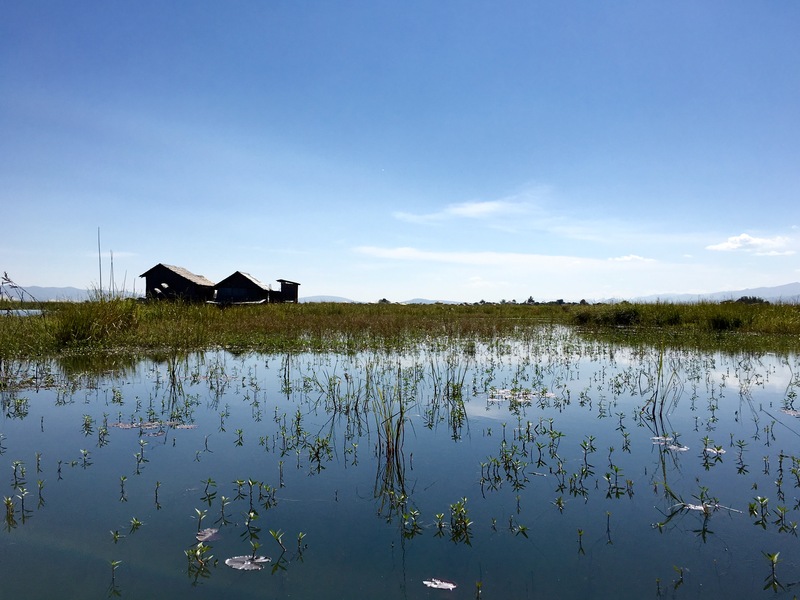 Your stay at Lake Inle sounds like it was both fun and laidback, I’ll keep it in mind for an eventual stay in the region. Thanks! Thanks for sharing this post, I really like the images you have taken. The lake really looks amazing and so does the large Hti. Happy travelling! Wow, aren’t you glad that you went to Inle, I know i’m glad you wrote about it and that too in such detail. I think we have to take everything we read online with a little bit of skepticism so you did right by asking people you trust about the location. Never really came across places where you have to pay to enter a “zone”but I think it keeps the tourism limited maybe so that’s always good. And the price isn’t steep so shouldn’t matter anyhow. Loved the photos and didn’t expect them to have vineyards so that was a surprise. 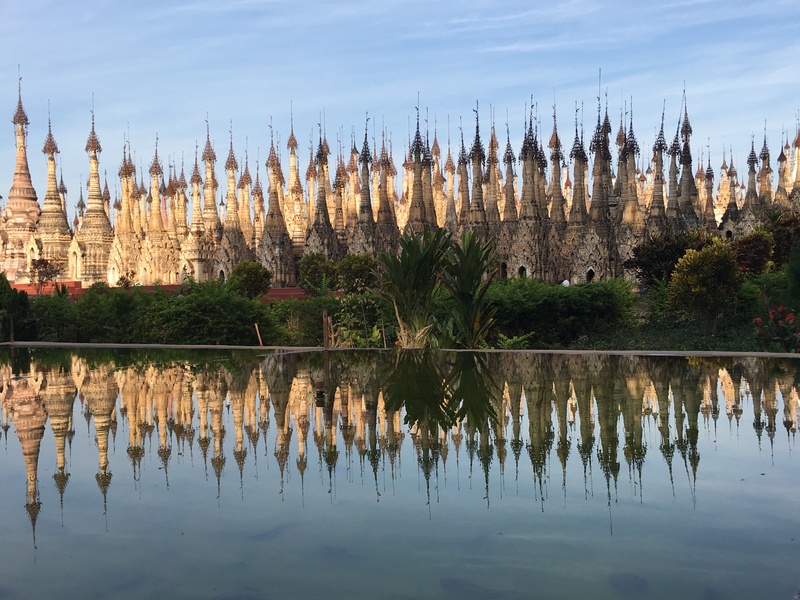 That photo of the pagoda complex with the reflection is simply stunning. THANK YOU for the advice on the curvy roads. We do not have motion sickness in our party, BUT once I took the road to Hana in Hawaii WAY too fast and have worried about that sort of thing since then. LOL! We had not allowed enough time to do the road and get to our flight. SO, my dad drove the car as fast as he safely could while I cowered on the back floor board and prayed. LOL! That moment has colored some choices since then. I’m not sure what would be best for us…day time travel by bus? We love admiring the scenery….but a flight would be a STRAIGHT shot. Hm…I would have to mull that over. We always travel with the kids and this experience would be one they would find so interesting. An entire village floating…cool! !